Medora, a young Greek girl, is sold to Pasha by a slave dealer. The pirate Conrad seizes Medora and declares his love for her. Conrad's right-hand-man, who is jealous of Conrad, sends Medora back to the slave dealer who again sells her to Pasha. Conrad and his men show up to take Medora away again but he is recognized through his disguise, captured, and sentenced to death. To save his life, Medora, who is in love with Conrad, plots with a slave girl, Gulnare, to escape. Medora agrees to marry Pasha but during the ceremony Gulnare takes Medora's place, having the ring placed on her finger. That evening Medora dances for Pasha, having convinced him to lay down his weapons, and Conrad enters to take her away. Gulnare produces the ring and declares herself Pasha's lawful wife. The ship on which Medora and Conrad escape sinks in a terrible storm but the two lovers are saved when they wash up on a rocky island. 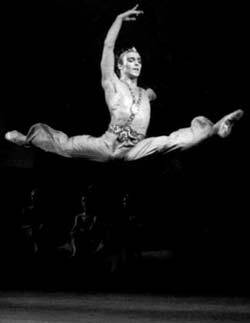 Le Corsaire was made famous by the Russian revivals of it by Jules Perrot in 1858 and Marius Petipa in 1868. The Petipa version had musical additions by Cesare Pugni and L�o Delibes. Petipa revived the ballet again in 1899 and added a pas de deux to music by Richardo Drigo. This traditional pas de deux will be performed by most dancers at some point in their career.